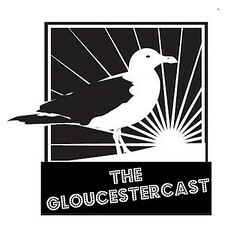 Gloucester pause – Merry Christmas! Our one of a kind Lobster Trap Tree at twilight on Monday evening. 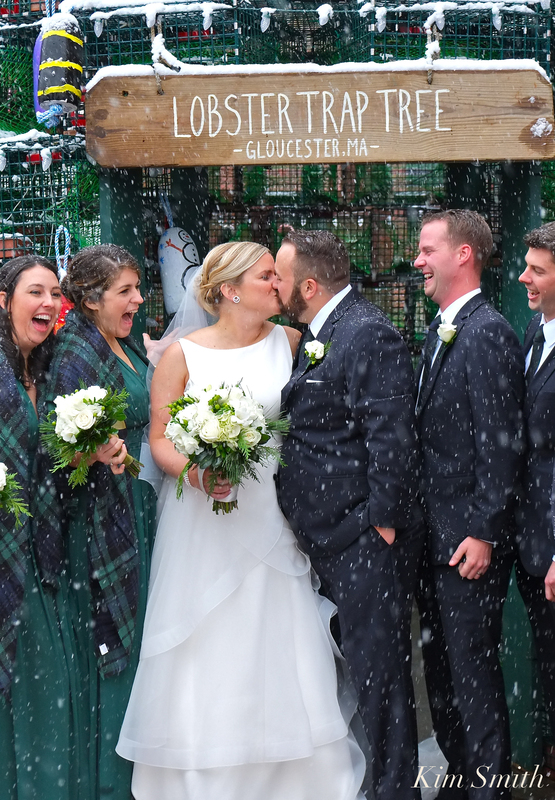 Thank you to Sheree Zizak, owner of the Beauport Hotel, who shared that the bride and groom that braved Saturday’s snowstorm to have photos taken in front of Lobster Trap Tree are Molly Ross and Ryan Stokes. Molly and Ryan held their reception at the beautiful Beauport Hotel. 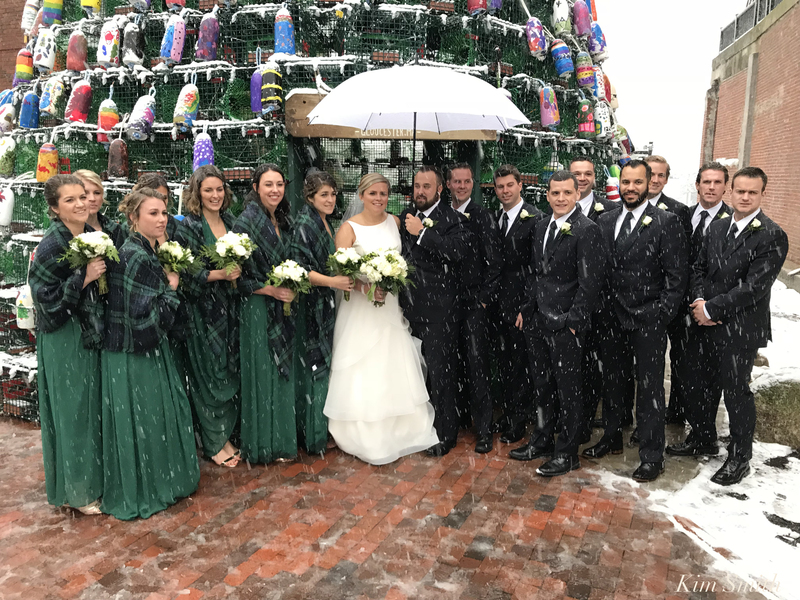 Many of us marveled at how relaxed were the wedding party, especially the bride and bridesmaids, wearing sleeveless dresses and gold heels in the slush and freezing snow. Art Haven’s program director Cathy Kelley, on the spur of the moment, quickly painted a buoy with wedding rings and the date, and David Brooks presented the buoy to the happy couple. Congratulations Molly and Ryan! 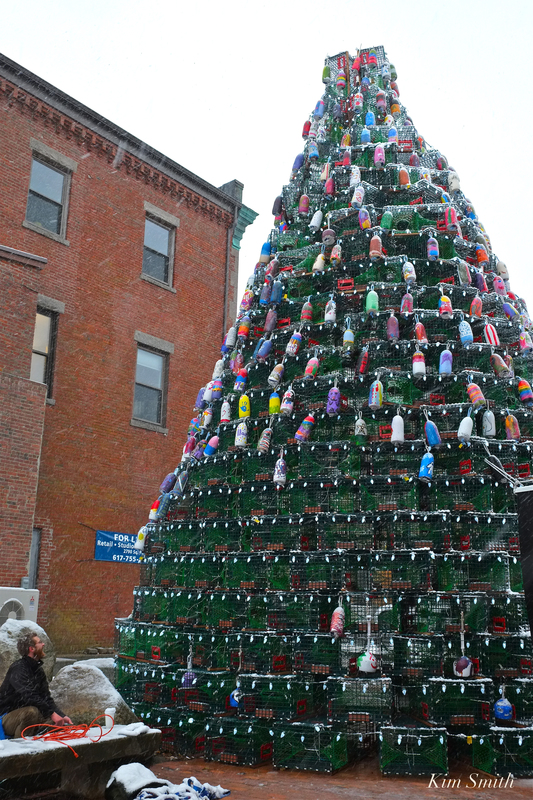 MORE PICS FROM #GLOUCESTERMA LOBSTER TRAP TREE LIGHTING FESTIVITIES! Last batch of photos from the festive and fabulous Lobster Trap Tree preparations, lighting, and party. 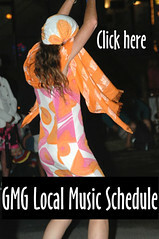 Go see–the tree looks beautiful day or night. 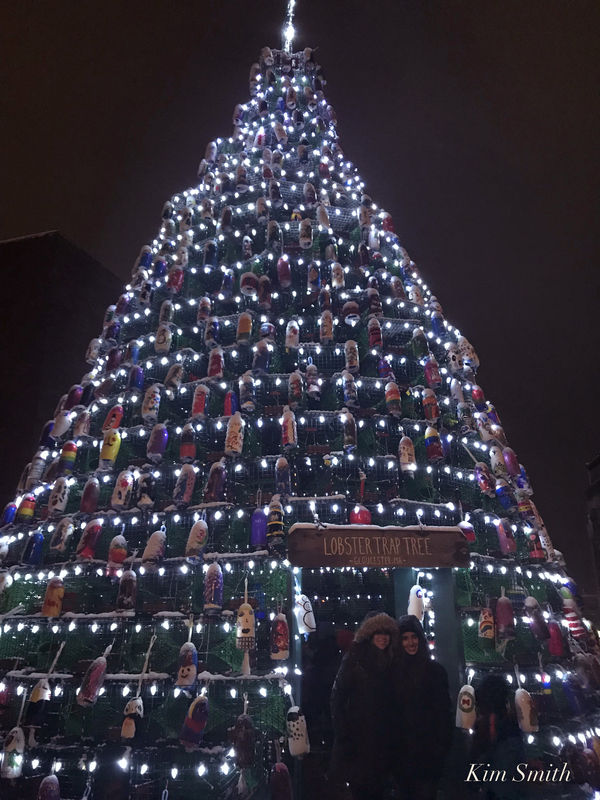 Hats off and thank you to David Brooks, Shawn Henry, Traci Thayne Corbett, Cathy Kelley, and every one of the volunteers who have created this wonderful holiday tradition for all to enjoy! See you at the Buoy Auction at Cruiseport on January 26th! WEDDING PARTY AT THE LOBSTER TRAP TREE! 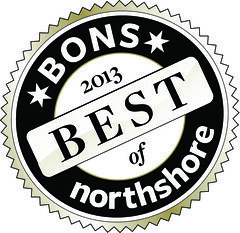 RAIN OR SNOW, COME ON DOWN FOR LOBSTER TRAP TREE LIGHTING TONIGHT! Despite the soggy wet snow and freezing temperatures, the Lobster Trap Tree lighting is taking place right on schedule. Caroling begins at 4:30. 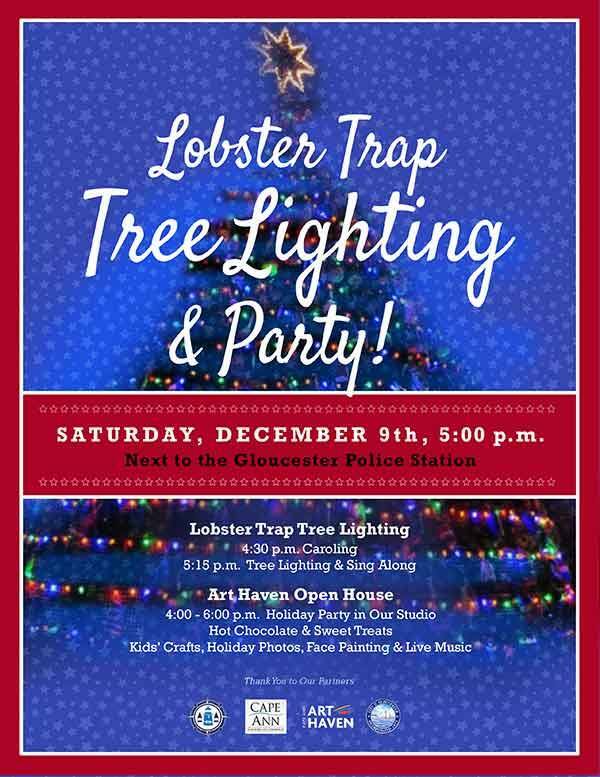 DON’T MISS LOBSTER TRAP TREE LIGHTING AND PARTY TOMORROW, SATURDAY, DECEMBER 9TH! Posted on December 8, 2017 December 7, 2017 by Nichole S.
Christmas at the Beauport is beautiful. I stopped by for an hour the other day while they were still in the midst of decorating. 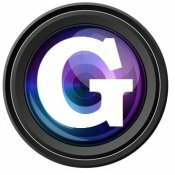 I struggled with wanting to take photos …and wanting to stay out of their way. 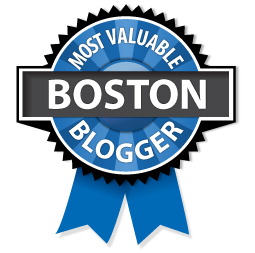 So, this is all I left with…but, you get the gist. I look forward to going back for a holiday cocktail and to enjoy the holiday ambience again soon. 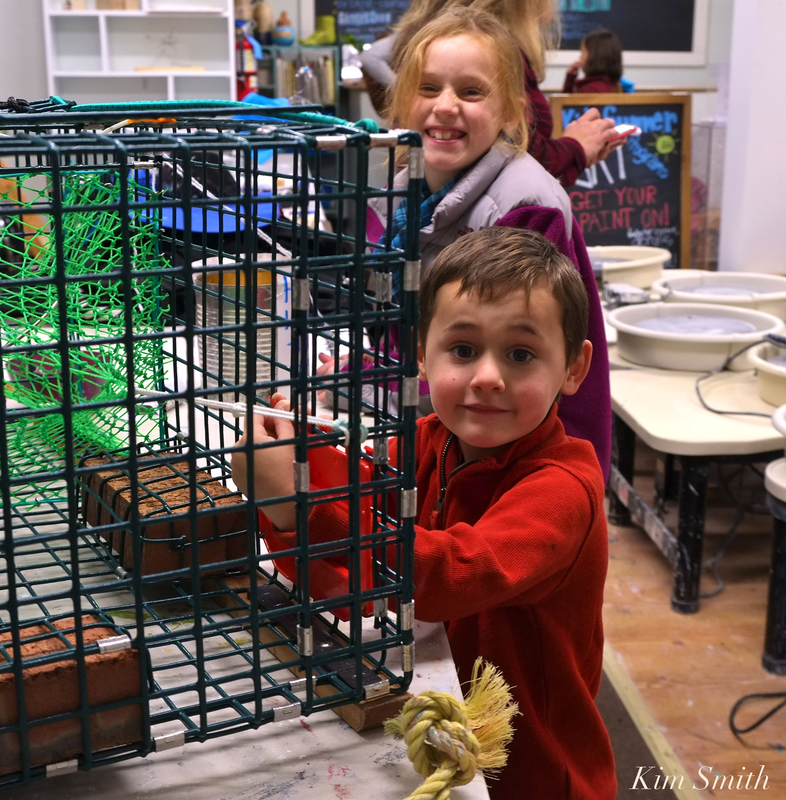 SCENES FROM THE LAST NIGHT OF OPEN STUDIO LOBSTER TRAP TREE BUOY PAINTING AND WHY WE LOVE CAPE ANN ART HAVEN! Thank you to Cape Ann Art Haven’s program director Cathy Kelley and executive director Traci Thayne Corbett for the invitation to photograph this year’s Lobster Trap Tree lighting and buoy painting. 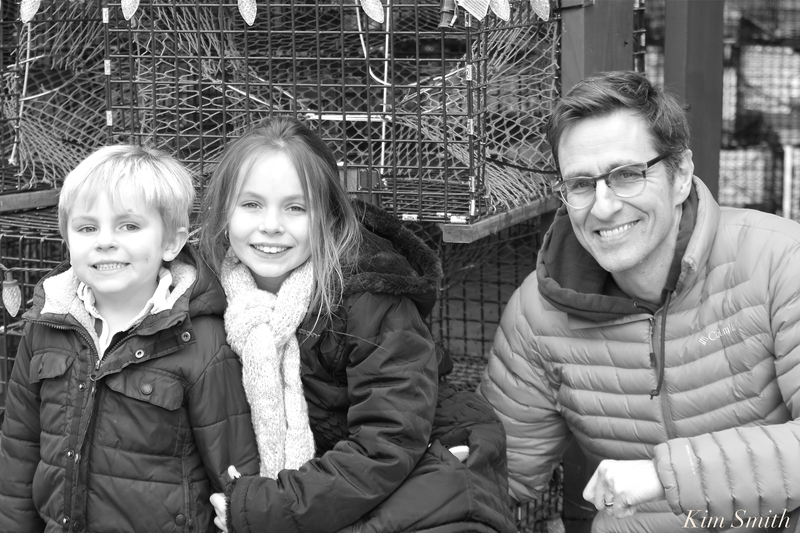 The joy was all mine–the children’s enthusiasm, the pride and joy on their faces, the parent’s participation, and the priceless gift of community spirit make this one of Cape Ann’s most cherished (and most fun) holiday traditions. 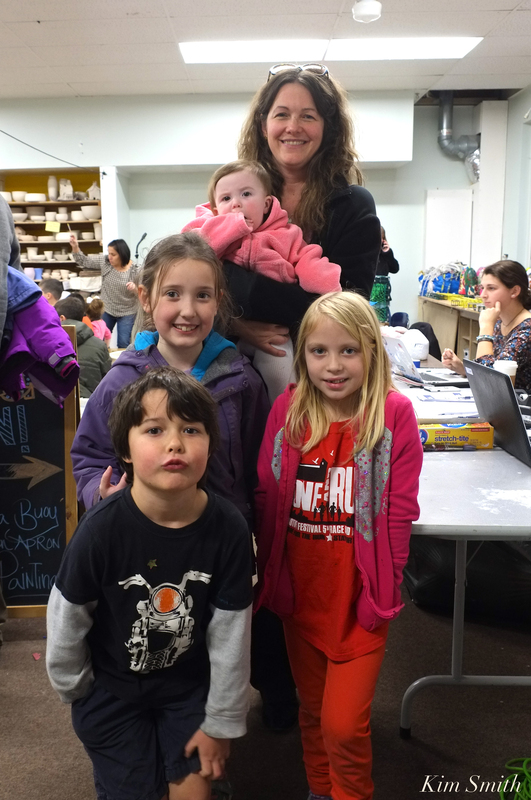 And it has been wonderful to see how conscientiously Traci and Cathy run the program and how caring and thoughtful they are with the children. 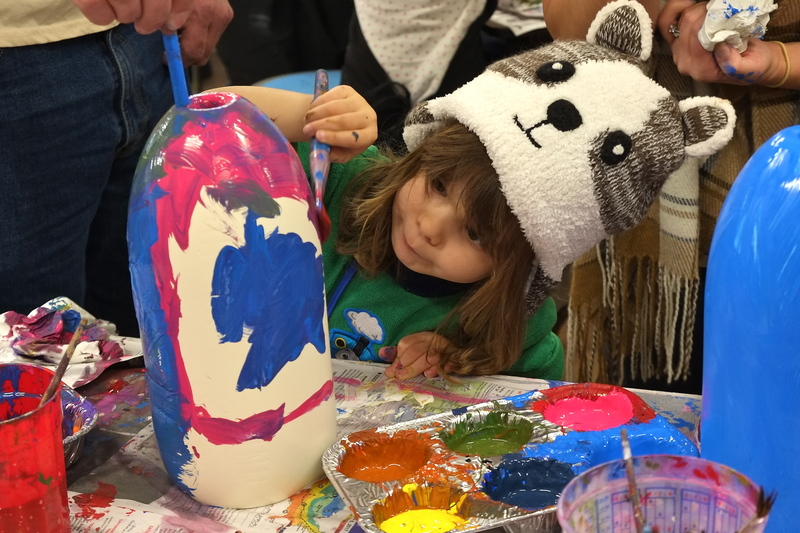 Did you know that Cape Art Haven buoy painting is 100 percent FREE and open to the entire community? What has become a much beloved Cape Ann tradition is a way of saying thank you from Art Haven to the community. 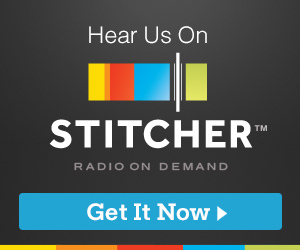 If you haven’t already done so, please consider donating to this tremendously worthwhile organization. 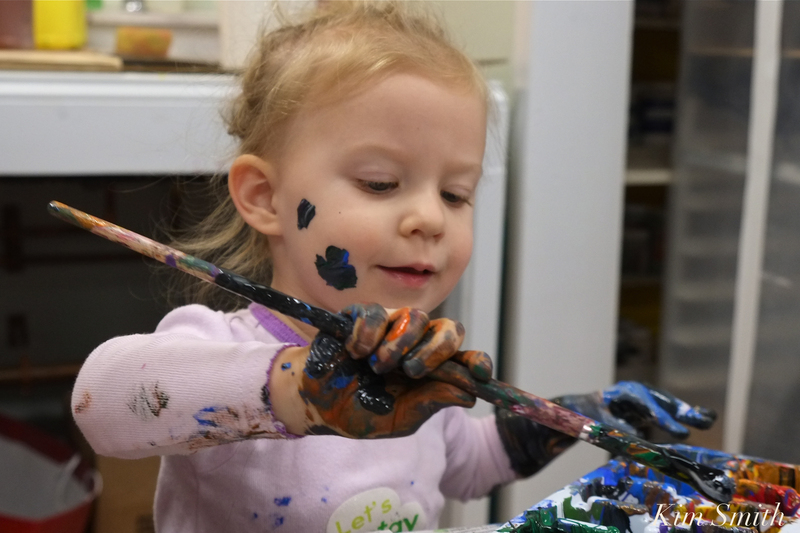 Not only is buoy painting free, but all the programs Art Haven offers are available to everyone, whether or not they have the ability to pay. 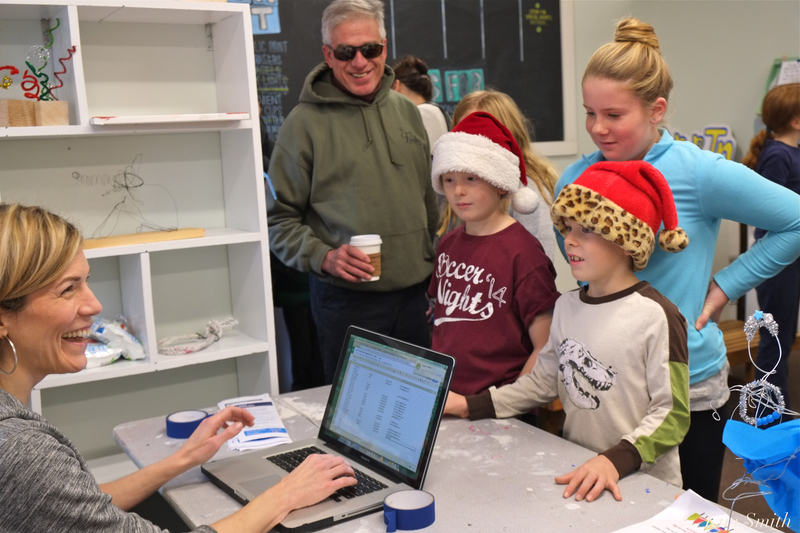 Visit the Cape Ann Art Haven website here to learn more about classes, scholarships, the teen guild, and more. So, please, donate to Art Haven today! 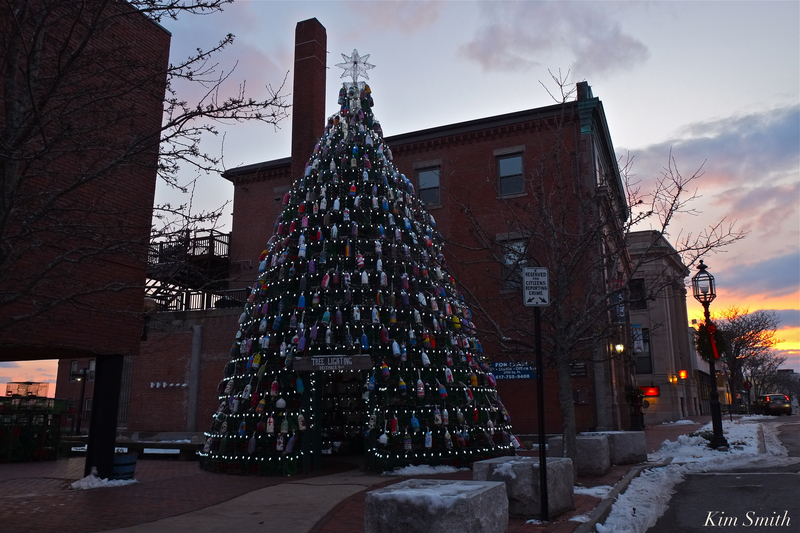 Lobster Trap Tree lighting Saturday, December 9th, at 4:30. Party after at Art Haven. 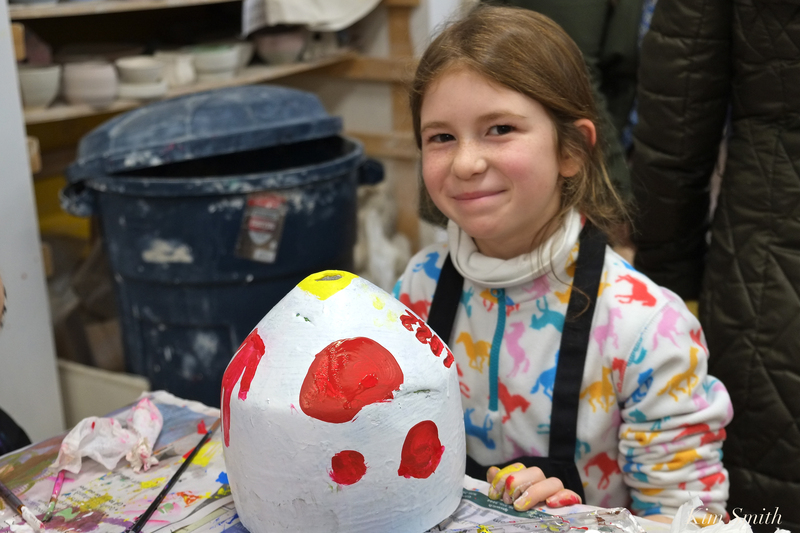 Posting lots of photos tomorrow from Cape Ann Art Haven’s last day of buoy painting before the grand tree lighting event (Saturday, December 9th at 4:30pm). 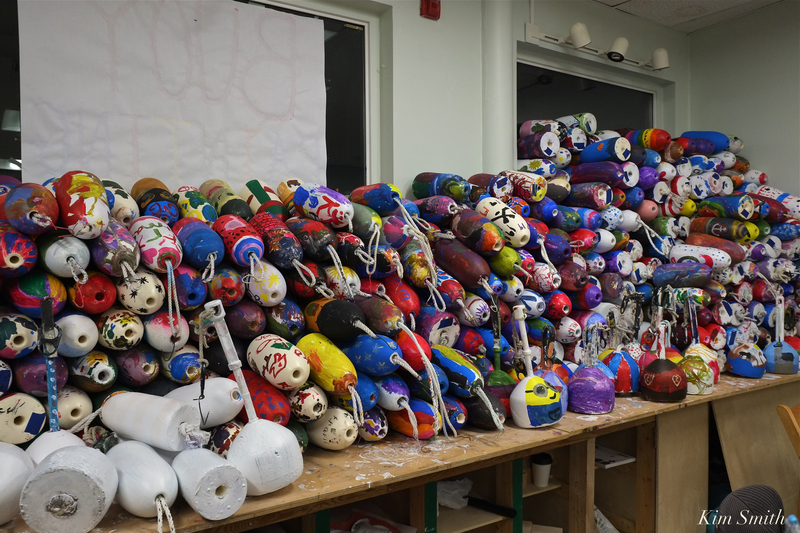 The wall of buoys is growing and growing! LAST DAY FOR BUOY PAINTING! Wednesday afternoon is the very last day of buoy painting before the great Lobster Trap Tree lighting. 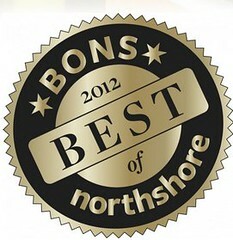 Don’t miss all the fun! 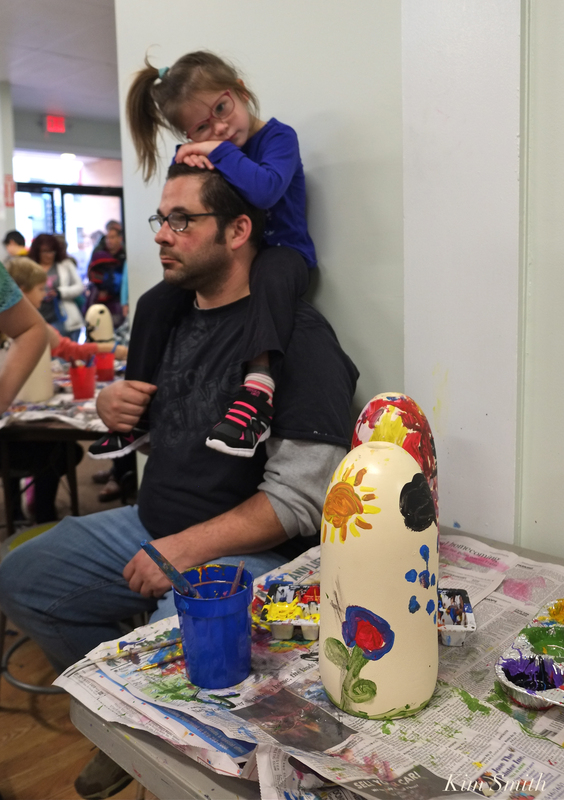 Throngs of young painters filled Art Haven today at the community-wide buoy painting for Gloucester’s very special Lobster Trap Tree. A line formed out the door, but it wasn’t a long wait before kids were seated at a work table, supplied with blank buoys, paints, and brushes. 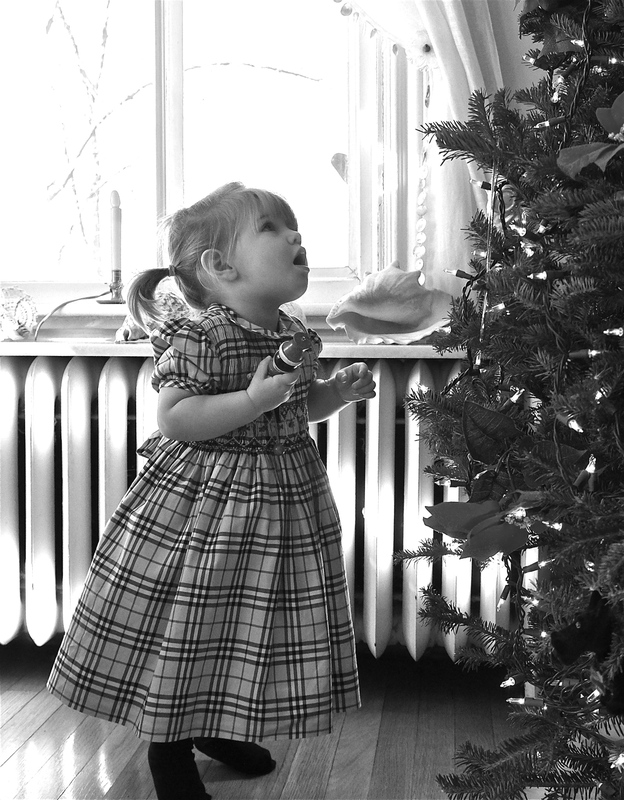 With thanks to founder David Brooks, executive director Traci Thayne Corbett, and assisted by a tremendous team of staff and volunteers, the children are participating in a wonderful holiday event, sharing a bit of Gloucester culture, holiday tradition, and FUN! On Monday, children from Rockport are invited to attend. 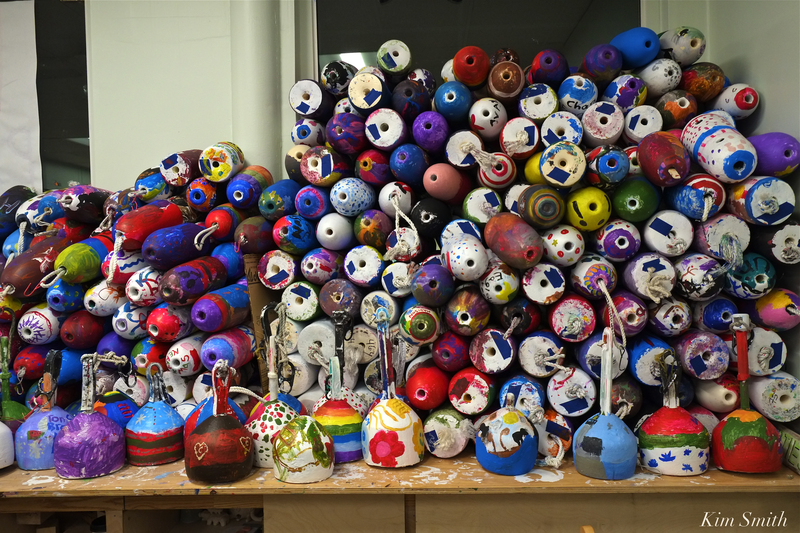 Wednesday, students form Manchester/Essex Elementary and O’Maley will be painting and Wednesday is also the last day for community-wide buoy painting. 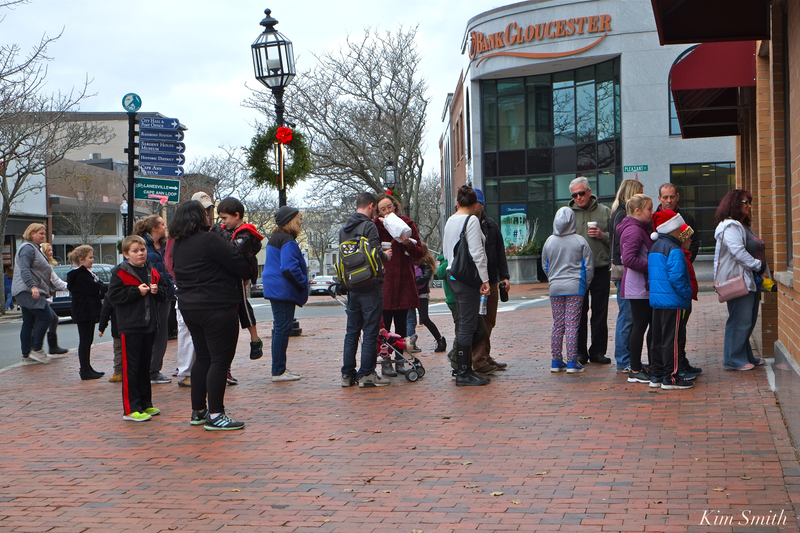 FOLKS LINED UP TODAY TO PAINT BUOYS AT ART HAVEN FOR GLOUCESTER’S LOBSTER TRAP TREE! NOT TO WORRY, THE LINE IS MOVING VERY QUICKLY. More photos tonight from Gloucester’s fabulous annual Art Haven Lobster Trap Tree buoy painting event. MCELHENNYS SPIED AT THE LOBSTER TRAP TREE! After painting buoys, the McElhennys stopped by the police station to meet several of the awesome Gloucester police officers. Dax could not have been more thrilled with his official Gloucester police sticker badge and officer cards.